Hi guys. I went to the doctor yesterday for my followup about my high cholesterol. I feel like I need to vent a bit. Is that okay? See, here's a picture of me, right now. We're talking face to face. Fun, right? So anyway...yesterday I went to the doctor for my followup from my last visit two months ago (when we talked about my high cholesterol numbers and my doctor told me that I needed to change my diet to see if it lowers my numbers). So, the last two months I've been "trying" to eat better. I've definitely not been perfect, but I've drastically reduced my meat and dairy intake. I've been baking less, so the sweet treats aren't here to tempt me. 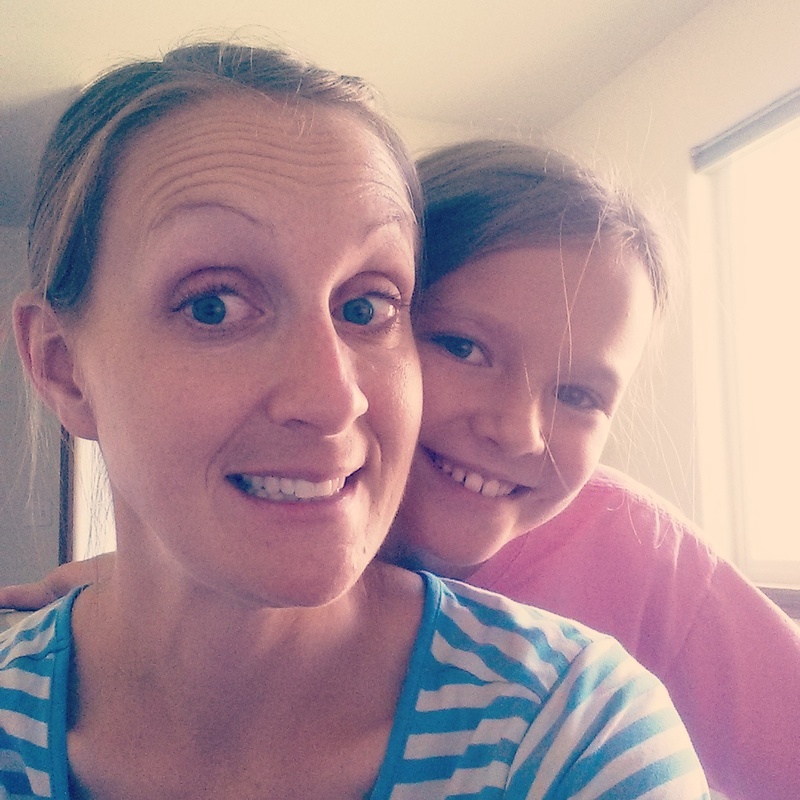 I've mostly just felt more guilty when I've eaten a hot dog or pizza for dinner with my family because I know how much cholesterol it has in it, but hey, it's summer and I've got kids...we have to eat something. Anyway. I had some blood taken a few weeks ago and we talked about the lab results yesterday. And the results said... (drum roll, please)............that my cholesterol went up! What the heck? My good cholesterol went up too, but by LDL (bad cholesterol) and overall cholesterol levels are high...like higher 200s or something bad. Other things in my blood have gotten better, which is good. My doctor asked if I could "tighten up my diet" for the next 6 months and we'll do more blood work and see if that has helped. So...for the next six months it's going to be interesting. Since I'm young (almost 34 in a month) and I exercise regularly and am otherwise healthy, I don't really look forward to the possibility of being on cholesterol medication (satins) for the rest of my life. On the other hand, it kind of sounds nice to just be able to take a pill and not worry so much about what I eat. 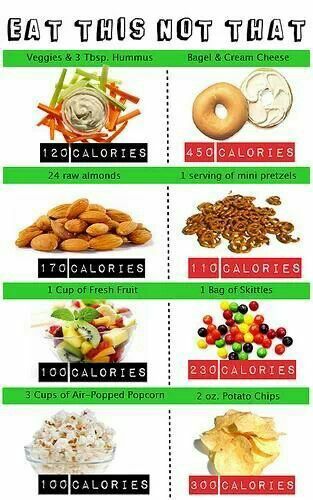 Good: Fruits, Vegetables, Whole Grains. Nuts. I feel like I just went through this...which I did, a few months ago. I tried to eat whole and only eat the "good" food and I really just ended up eating insane amounts of peanut butter on celery and apples. Not so good. I'd have good days and then really bad days when I'd totally break out the pretzels and nutella. 1. Only eat baked treats on Sunday when my daughter makes them. 2. Extremely limit carbs and only eat whole grains. 3. Continue to cut down on amount of meat I eat. 4. Limit dairy and keep it low-fat. Say goodbye to late night bowls of ice cream. 5. Eat lots of yummy vegetable and whole grains. 7. Find lots more new recipes that are heart healthy. My family is going to have to eat more what I eat for dinner. My husband is on board with this....and my kids will survive, I guess. 8. Blog along the way. Hopefully I'll end up with lots and lots more heart healthy recipes here. I have lots of yummy recipes, but they usually involve lots of butter, sugar or lots of meat and dairy. I love this picture, because this is totally what I've been trying to do (and will definitely get better at). I've been meaning to menu plan, but I honestly can't think of things that I want to start making. I've got to get over the list of "don'ts" and remembers all the yummy things I can eat. 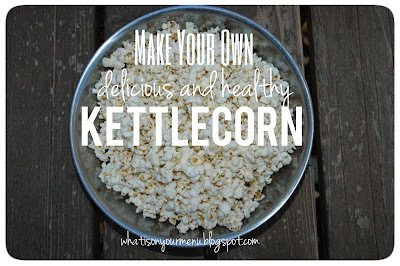 I'm definitely going to be making lots of kettlecorn (whole grain, right? with a tiny bit of sugar and coconut oil). 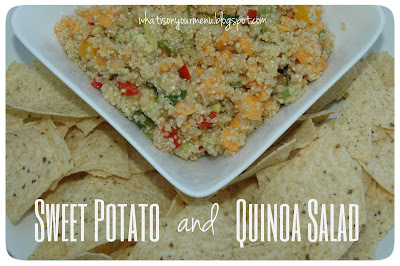 This sweet potato quinoa salad will be making an appearance too...I ate it almost every day during the whole month of June. 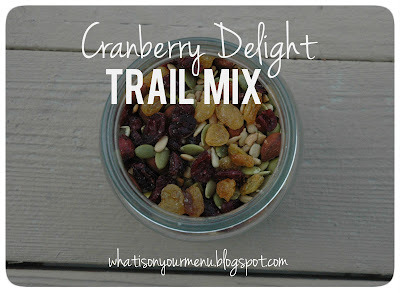 My whole family loves this trail mix. Yum. This was my lunch today...hummus and veggies from my garden, plus some almonds and extra cucumbers. 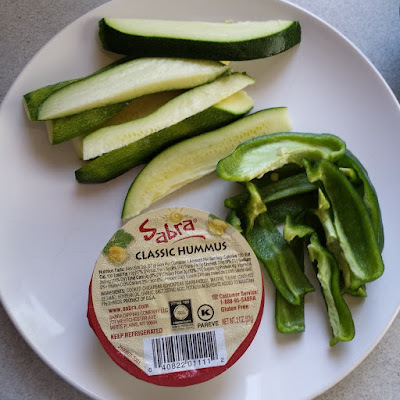 I love these little single servings of hummus. I seriously eat it almost every day. Anyway....I appreciate all the sweet comments from my friends during the last few months. It's nice to know that I'm not the only one out there that has this problem and is trying to change eating habits. I'll keep posting and hopefully have lots more low cholesterol recipes soon. Wish me luck!